When people hear the words “Vegas wedding” a certain image tends to come to mind. And we’re okay with that. Any excuse for a wedding in Vegas is a good excuse—whether it’s for the iconic Vegas Wedding, or whether it’s for something maybe a little more traditional, something unique, something indoors, something outdoors, glamorous, casual… whatever your dream, Vegas really is the place that has it all. From the chefs to the shows, where else are you going to find so many world-class amenities right at your fingertips? Let’s put it this way: Is Wolfgang Puck on the list of potential caterers back in your hometown? Only in Vegas! Really, if there’s a problem with planning a wedding in Vegas it’s that there’s almost too much to choose from. The area hosts a virtually unending variety of venues and options, meaning whatever you’ve dreamed of for your special day, Vegas has it. And though you can be certain that no two events here are alike, if there’s one thing every Vegas wedding has in common it’s that they’re all unforgettable—each in their own way. So if you’re looking to create wedding memories that last a lifetime, here are 10 one-of-a-kind locations that promise a Vegas wedding you and your friends and families will absolutely never forget. Every bride wants to feel like she’s walking on clouds on her big day, so why not tie the knot 550 feet in the air aboard the High Roller at The LINQ? As the world’s tallest observation wheel, the High Roller features 28 luxurious cabins that hold up to 40 guests each, and soar high above the Strip providing views that add a uniquely scenic element to the occasion. A variety of wedding packages are available along with traditional amenities including flowers, music, photography, cinematography and even a hosted bar. Did you know that world-renowned chef Wolfgang Puck owns nine different restaurants around Vegas? It’s true. From the world-famous Cut at The Palazzo to Lupo at Mandalay Bay, Wolfgang is all over town. 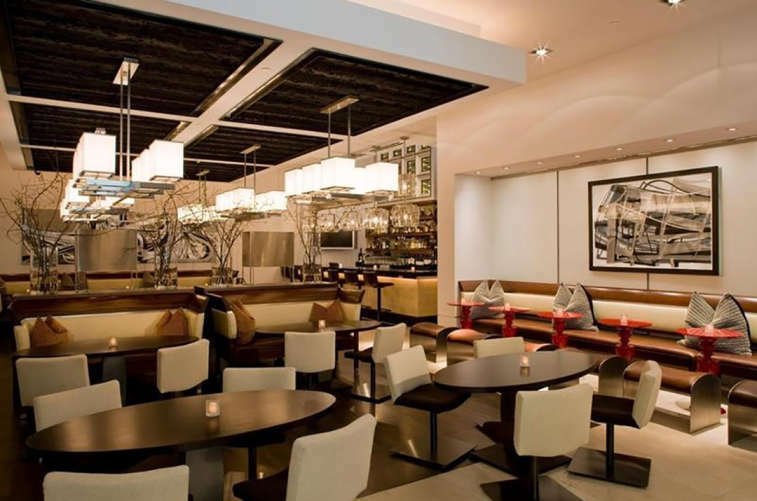 Each Wolfgang Puck original features its own menu, its own style and its own unique, unmistakable Wolfgang Puck touch. Just imagine telling your guests who you have catering your big event! But a Wolfgang Puck wedding is about more than just world class dining, it’s about style, it’s about tradition, and it’s about an impeccable eye for detail that make it an occasion like no other. Their catering services can handle any size party, any theme and any other special requests. It’s your day, it’s your style, and Wolfgang Puck makes it your dream come true. If you’re looking for a wedding location that combines that “only in Vegas,” unique feeling with all the glitz and style of a traditional affair, then the Mob Museum is, well, an offer you can’t refuse. Located in the meticulously restored former Federal Courthouse and U.S. Post Office building in downtown Vegas, the museum is the perfect place for fun-loving couples to add a little underworld flair, drama and fun to their special occasion. Along with traditional amenities including white-linen catering for up to 150 people, flowers, photography, DJ and more, the Mob Museum allows guests full museum access and even provides fun takeaway items from flasks to fedoras. A variety of wedding packages are available and the fun is something the whole gang can get in on. As one of Downtown Vegas’ most modern and elegant hotels, the Downtown Grand plays host to wedding events that are truly second to none. Choose from several locations around the hotel—hey, you could get married poolside!—as well as an almost endless variety of catering and entertainment packages to create the perfect occasion for your friends and family. Their certified wedding planners can make your dreams come true. Go all-out or go on a budget, any wedding at the Downtown Grand is sure to be an occasion that will create memories that last a lifetime. What better venue could there possibly be to host a wedding that’s a true work of art than The Smith Center for the Performing Arts? 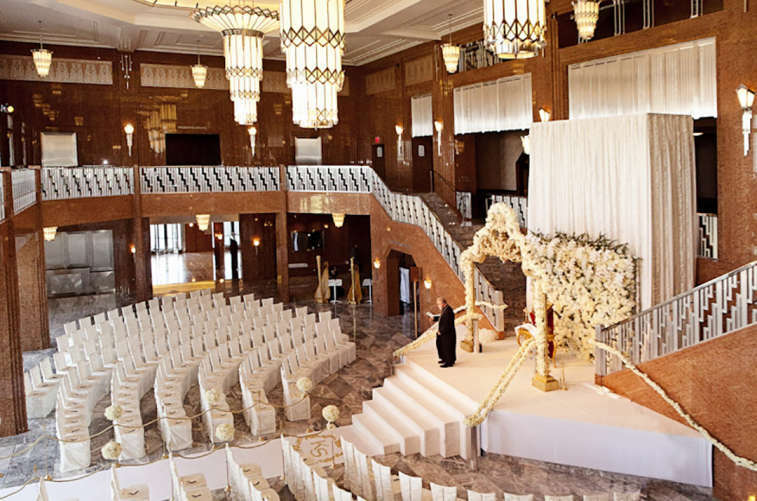 With its stunning art deco style and a variety of venues from the Grand Lobby to the Cabaret Jazz Club, every wedding here is truly a performance to behold. You’re the star of any production at the Smith Center and your event is sure to be the smash hit of the season! Every angle is a good angle here, and there are elegant and dramatic photo opportunities at every turn. The options are as varied as the arts themselves but the stage can literally be yours! If you want to leave the neon lights and high energy of the Strip behind and celebrate your big day in the peace and tranquility of nature, The Grove is just the oasis you’re looking for. 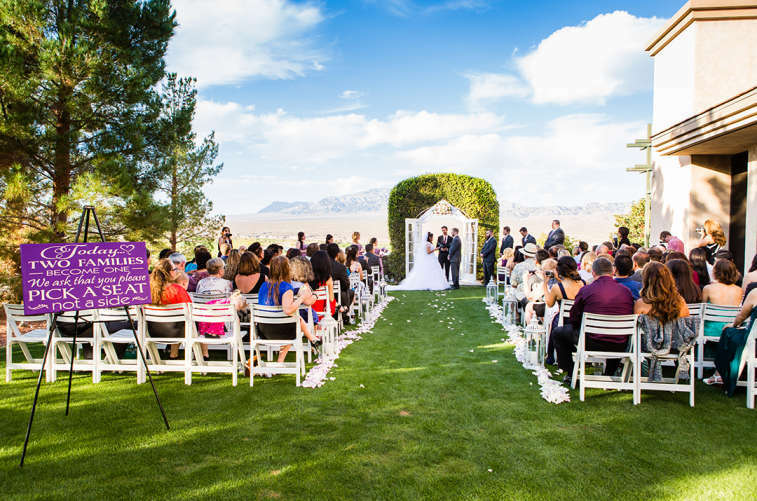 Located just a drive from the Strip, it’s like the Vegas wedding that’s not a “Vegas wedding.” There’s nothing quite like an outdoor wedding amidst the sights and sounds of nature, and yes, you can find it in Vegas! Share your vows surrounded by not just friends and family but almond trees and an old fashioned gazebo as well. Professional coordinators and packages are available along with your choice of 2 elegant reception rooms that can accommodate up to 250 people. The Grove is the place where you can get away from it all and still have it all. If a wedding is all about creating memories that last a lifetime, then there’s nowhere more appropriate to tie the knot than at Las Vegas’ one-of-a-kind Keep Memory Alive Center. The stunningly unique, Frank Gehry-designed facility was built in dedication to the Keep Memory Alive Foundation. 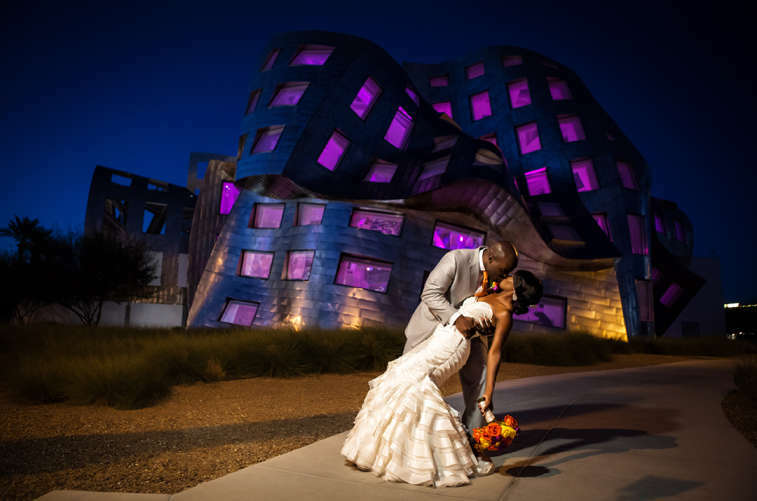 The facility is just a few minutes from the Strip and between the building’s uniquely-Gehry design and all the standard, first-rate wedding amenities, it’s the perfect place to begin making memories together. If you want to go small but at the same time you want to go grand, there’s no grander little venue than the Titanic Grand Staircase at Luxor. Limited to just 15 guests and serving as a ceremony-only facility, the Grand Staircase is a breathtaking spot to set sail on your life together. This perfect replica of the great ship’s most famous focal point is as elegant today as it was over 100 years ago. Step back in time to an era of elegant style while you embark on your future. It will undoubtedly be a night to remember forever. If traditional, classic wedding elegance is what you’ve always dreamed of, then a wedding at the ARIA Resort & Casino is literally a dream come true. 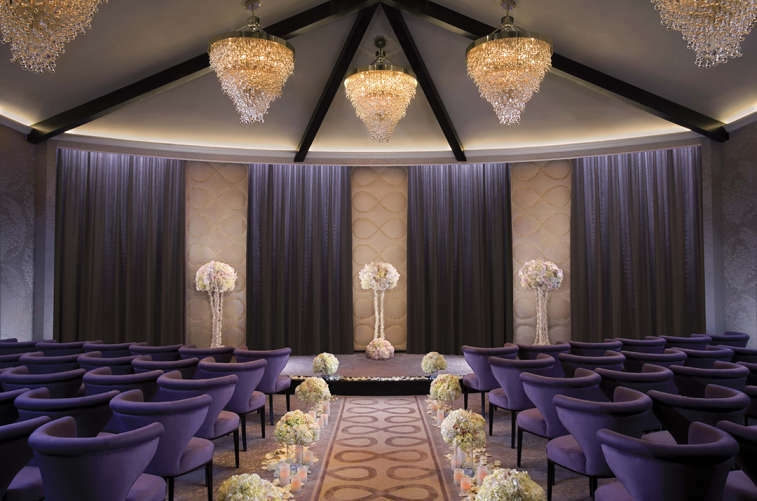 Each of the 5 exclusive wedding locations around the hotel is as elegant and inviting as the next. From the charming grace of the Wedding Chapel to the artistic beauty of the GALLERY, you can’t go wrong with whatever you choose at the ARIA. Check out their impressive list of “Best of” awards and testimonials and you’ll quickly see why an ARIA wedding is truly a work of art unto itself. Are you and your betrothed a golfing couple? Or maybe you’re just a couple who appreciates the natural beauty a golf course can provide? Either way, getting linked out on the links is a great way to go, and the Paiute Golf Resort is a great option. The peaceful, rolling beauty provides the perfect, colorful backdrop to your special event. With a myriad of options available, a wedding at Paiute is, okay we’ll say it, a hole in one!